Continuous improvement helps you identify opportunities for work process enhancements and reduce waste. Learn more about Continuous improvement and its advantages. In Lean, continuous improvement is like a religion. Although it seems like a simple thing to achieve, leaders and teams, who are not familiar with process improvement techniques are having a hard time sustaining it. To implement this mindset, you need to have a clear understanding of what exactly is continuous improvement, what principles you need to follow, and check some of the best practices. The term continuous improvement can be very abstract if not placed in a specific context. Explained shortly, it is a never-ending strive for perfection in everything you do. In Lean management, continuous improvement is also known as Kaizen. Kaizen originated in Japan shortly after the end of the Second World War. It gained massive popularity in manufacturing and became one of the foundations of Toyota’s rise from a small car maker to the largest automobile manufacturer on the planet. In the context of the Lean methodology, continuous improvement seeks to improve every process in your company by focusing on enhancing the activities that generate the most value for your customer while removing as many waste activities as possible. Muda consists of 7 major process wastes: transport, inventory, motion, waiting, overproduction, over-processing, defects. Removing all of them completely is nearly impossible but focusing on minimizing their negative effects on your work is crucial for the successful implementation of continuous improvement. Mura is caused by unevenness or inconsistency in your process. It is responsible for many of the 7 wastes of Muda. Mura stops your tasks from flowing smoothly across your work process and therefore gets in your way of reaching continuous flow. Muri is a major problem for companies that apply push systems. When you assign too much work to your team, you place unnecessary stress on both your team and process. Muri is usually a result of Mura and if you want continuous improvement to become part of your culture, you need to focus on getting rid of those wastes. Understanding the theory behind it is the first step in applying continuous improvement to your management culture. In order to set yourself up for continuous improvement, you need to create a suitable environment within your company. 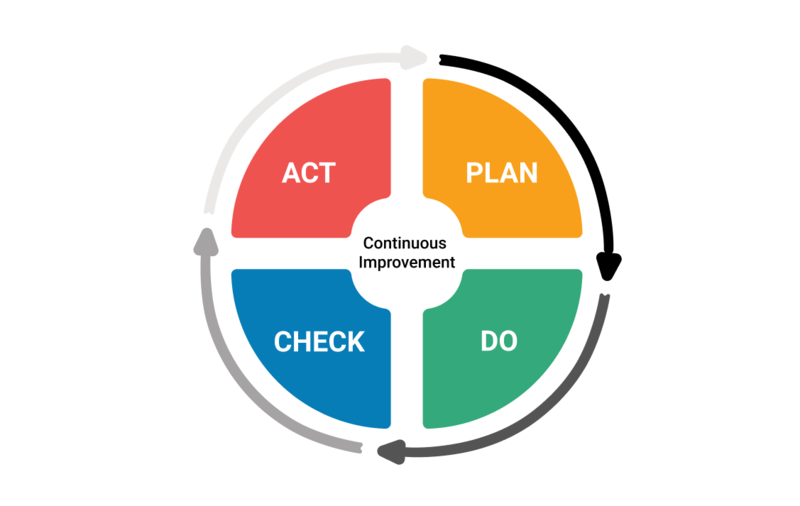 The model Plan-Do-Check-Act is the most popular approach for achieving continuous improvement. Also known as the Deming circle (named after its founder the American engineer William Edwards Deming), it is a never-ending cycle that aims to help you improve further based on achieved results. It was first developed for quality control but in time became an instrument for achieving continuous improvement. In the planning phase, you need to establish objectives and processes necessary to deliver results in accordance with the expected output (the target or goals). Setting output expectations is a key to achieving continuous improvement because the accuracy of the goals and their completeness is a major part of the process of improving. It is recommended to start on a small scale so you can test the effects of the approach. The second phase is “Do”. It is straightforward as you need to execute what you’ve laid down during the planning step of the process. After you’ve completed your objectives, you need to check what you’ve achieved and compare it to what you’ve expected. Gather as much data as possible and consider what can you improve in your process so that you can achieve greater results next time. If the analysis shows that you’ve improved compared to your previous project, the standard is updated and you need to aim for an even better performance next time. In case, you’ve failed to improve or have even achieved worse results compared to the past, the standard stays as it was before you started your last project. Root Cause Analysis (RCA) is a technique, practiced in Lean management that allows you to achieve Kaizen by showing you the root causes of the problems in your process. It is an iterative practice that drills down into a problem by analyzing what caused it until you reach the root of what is causing the negative effect. It can be considered root only if the final negative effect is prevented for good after the cause is removed. To apply RCA for continuous improvement, you need to perform a thorough analysis of the problem. For example, let’s say that you are leading a software development team. When you released the latest update of your product, your support team was bombarded with bug reports from customers. You begin to look for the root cause starting from the top of the problem. You investigate how your QA team allowed for this to happen and discover that they failed to run all the necessary tests on the software. Afterward, you look into what caused that and learn that the development team provided them with the features that were to be released at the last possible minute. Looking into the cause of that, you find out that the developers finished the majority of features right before they submitted them for quality assurance. Digging into the cause of that, you find out that your development team took more time than you have planned to develop the features in first place. Investigating the reason behind that, you discover that your team was inefficient because each developer worked on a few features simultaneously and therefore instead of giving features one by one to QA they submitted a batch that was too large to process on short notice. Analyzing why this happened, you realize that you haven’t placed any regulations on the amount of work that can be in progress simultaneously and did not ensure the evenness of your process. Reaching this point you get to the conclusion that the root cause of the bug problem is Mura (the waste of unevenness). To achieve continuous improvement, we suggest you analyze the root cause of each problem and experiment with solutions. Often, problems may turn out to be far more complex than you think and the RCA would require a few iterations before preventing the negative effect from ever happening again. 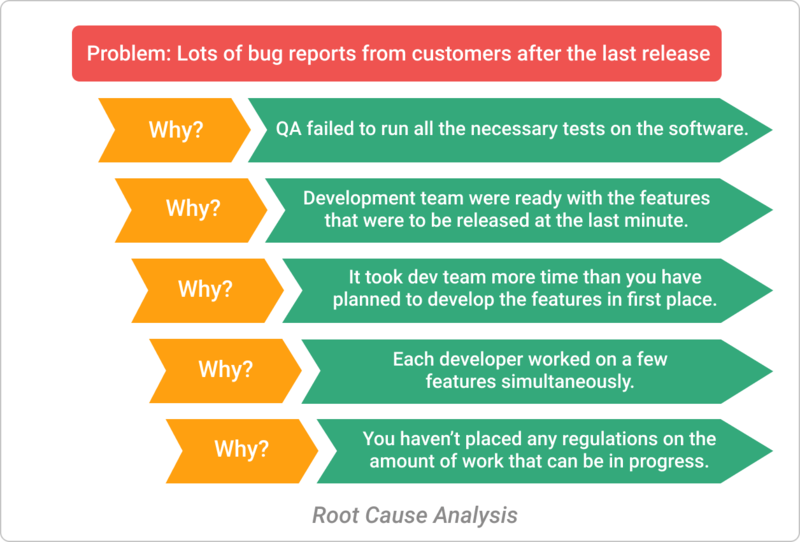 If you are not sure how to perform a root cause analysis, we suggest you look into the 5 Whys for determining root causes. In order to continuously improve your process, you need to have a clear visualization of what needs to be improved. If you lack visibility, you’ll be able to improve from time to time but won’t be able to spot symptoms of a problem before it is too late. When Toyota was looking for a way to do that, they developed Kanban as a system for improving the workflow efficiency of the production process. To visualize your workflow, the method relies on whiteboards for mapping every step of your process. The board is divided by vertical lines forming columns for the different stages. A basic Kanban board consists of three columns: Requested, In progress, Done. Each task that your team is working on is hosted on a Kanban card (originally in the form of a post-it note) and needs to pass through all the stages of your workflow in order to be considered complete. Kanban boards allow you to monitor the evenness of your process and can be a serious weapon for minimizing Mura. In addition, they show you the amount of work that every person on your team has and can help you prevent overburden (Muri) by allowing you to delegate tasks accordingly to the capacity of your team. Last but not least, you can monitor the pace, at which work is progressing across your workflow and achieve continuous improvement of your workflow efficiency. For the sake of eliminating interruptions, Kanban relies on limiting the work that can be in progress simultaneously. The goal is to eliminate multitasking which is nothing more than a constant context switch between assignments and only harms productivity. 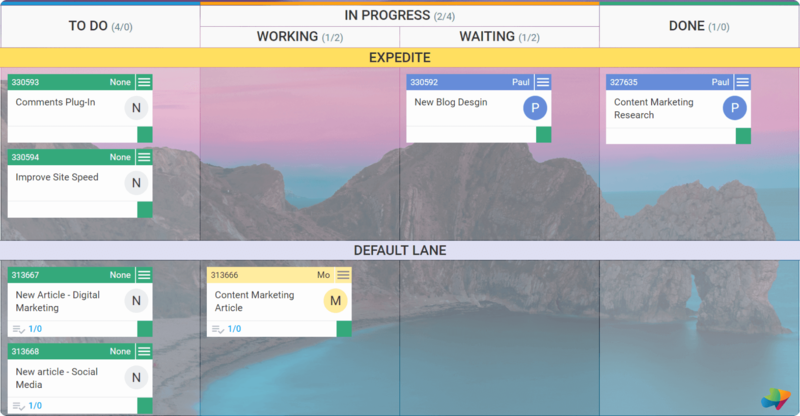 With the help of Kanban, you can manage the flow of work in your process. To ensure an even process, you need to be aware of where work gets stuck and take action to alleviate the bottlenecks in your process. This way you can experiment with the different steps of your workflow and keep improving continuously. In Lean management, continuous improvement is a group activity. Therefore you need to make sure that your team understands the common goal and why their part of the process is important. By making process policies explicit, you’ll encourage your team members to take more responsibility and take ownership of their process. For positive change to happen, there needs to be a constant flow of knowledge between you and your team. The Kanban board itself is a great feedback loop generator because it makes it visible who is doing what at any time. In combination with the widely adopted practice of holding daily stand up meetings between the team, you can continuously improve information sharing between individuals. Other techniques that are part of the continuous improvement arsenal are the Gemba walk and the A3 report. The A3 report is a structured approach that helps you deal with problem-solving issues, while the Gemba walk encourages you to go and see where the real work happens. Both are extremely useful and they can help you discover problematic parts in your workflow. Kaizen is a never-ending quest for perfection, but you’ll start feeling the benefits of continuous improvement on your business when your whole team takes it by heart. Kanban and the other continuous improvement tools can help you plenty with that because your team will obtain lots of knowledge about process improvement and workflow management. As a result, each individual will gain a better understanding of how your process works and how it can be improved.